The view outside our hotel room here in Philadelphia looks out over the Christ Church Burial Ground, the final resting place of Benjamin Franklin who, besides helping draft the Declaration of Independence and the Constitution, is also known as one of the first people to harness electricity. As I sat in my manual wheelchair, looking out over his grave site this morning, I couldn’t help but wonder if he ever could have envisioned a man being as dependent on that discovery as I am today. Probably, he was a pretty sharp guy. I’m pretty sure, however, he may not have imagined me using his discovery to have digital conversations with one of the world’s most prominent travel conglomerates in 140 character snippets over something called the Internet. But in his defense, I never would’ve pictured going back and forth with United Airlines on Twitter either, but that’s how my morning started. I guess it’s time to admit that my life has gotten way more interesting since last Saturday. After finishing off the most surreal communiqué of my life, the only other real order of business left was notifying Amtrak that I would be bringing not one, but two wheelchairs with me to the station for our trip to Washington DC tomorrow. That’s going to cost United another hundred bucks because the dead chair needs a ticket of its own. 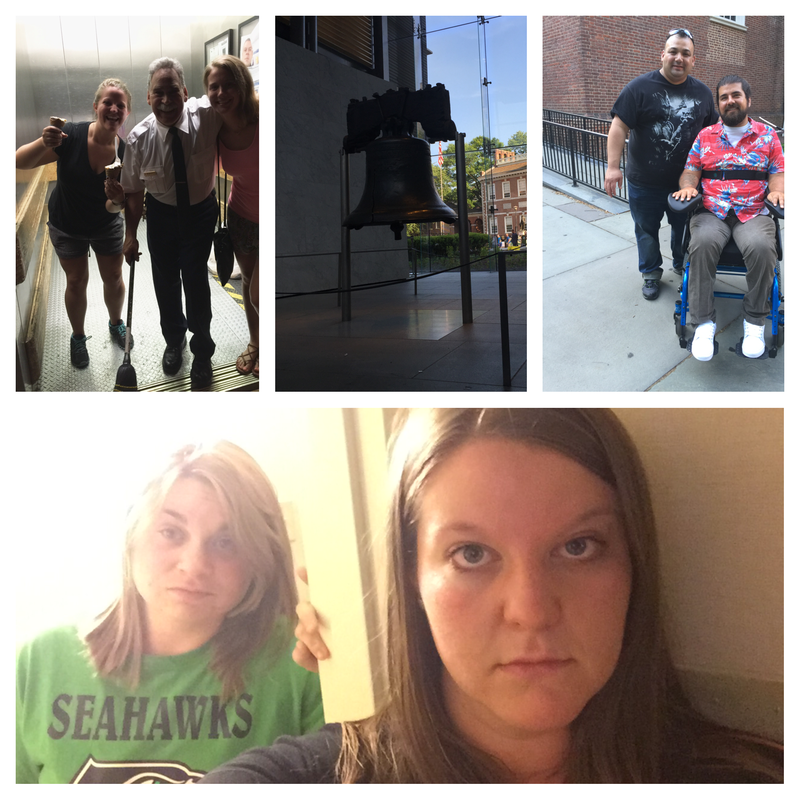 With all of that taken care of, Claire and I had the rest of the day to explore Historical Philadelphia. 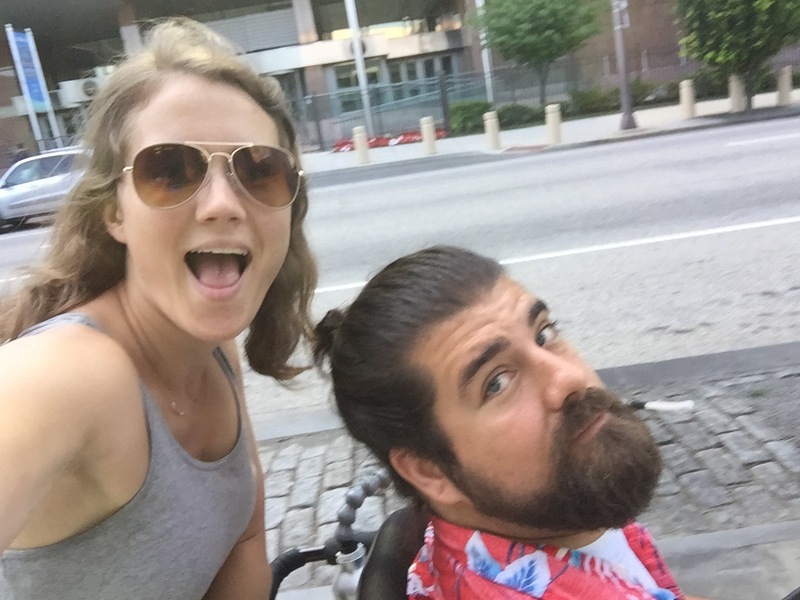 If we thought it was difficult to navigate New York City with three people tag teaming a hand control power chair, making my girlfriend push me through miles of old brick roads was even worse. But as we made our way around through so many historical monuments, I could feel my discomfort and annoyance with my current predicament began to fade, lost in the background of a larger perspective. Visiting spots like the Constitution Hall, the Liberty Bell, and, particularly, The Tomb of the Unknown Revolutionary Soldier — which served as a mass grave of thousands who lost their lives in the American Revolution — snapped me out of my funk rather quickly. It was a pretty stark reminder that pain is part of the process, and that maybe, just maybe, this little blip on the radar is just that last catalyst that galvanizes my commitment to advocating for people in my situation. One of our last stops was at Independence Hall, where both the Declaration of Independence and the Constitution were adopted. We caught the very last of their express tours before closing. The tour itself was short, we only got to see the Supreme Court room, central hall and the assembly room. It was in that last room of the abbreviated tour that the guide talked about how the founding fathers had the foresight that this country would evolve, which is why they programmed in an amendment process that gave way to the abolition of slavery, women’s suffrage, the civil rights movement of the 60s, the ADA in the 90s, and the current battles for gay rights. The guide wrapped everything up by saying they is still plenty of work to do, which is exactly why we are headed to the capital tomorrow; to declare that my independence matters just as much as everyone else’s does; that I have the right to travel without putting myself in danger. And it was one tiny act of kindness by a stranger right before the tour began that brought it all together for me. While waiting in line, a man named Pascual struck up a conversation with Claire and me. Because she was pushing my chair, I never really got to see his face. We chit chatted and learned he was from Virginia by way of San Jose. When we approached the ramp heading into the hall, he gently nudged Claire aside, offering to push me around for the next 20 minutes so she could have a break. It’s those little gestures by so many people this last week that have lightened the load on these paralyzed shoulders. There’s Dorothy, the sweet Jewish lady we met on the New York Metro who told us of how she was smuggled out of Germany as a child to escape the wrath of the Third Reich and ultimately went on to work with United Nations, proving survivors can make a difference. There’s Ernie, the most charismatic service elevator operator on the planet that reminds me that we all have a job to do, so we might as well do it with passion. There’s George and everyone at the Axis Project serving as inspiration for what The Here and Now Project can and will become. There are the countless people sending messages, phone calls, texts and tweets reminding me that I’m not alone on this journey. There are the Bobbseys, who have graciously and sometimes begrudgingly stuck with me through three of these catastrophes and made these learning experiences possible. And finally, there is this girl who didn’t let me turn back when my chair flickered “CONTROLLER FAULT” half a dozen times while we did the tourist thing on our final day in New York. And she didn’t complain once about pushing me over cobblestones and bricks in mid-80° weather today, proving that love really is the answer, that love will find a way. I just realized that this is only halfway through our trip. Who knows what the second half will bring. Whatever it is, I know we’ll get through it together. Thanks for all the support so far.